You are here! 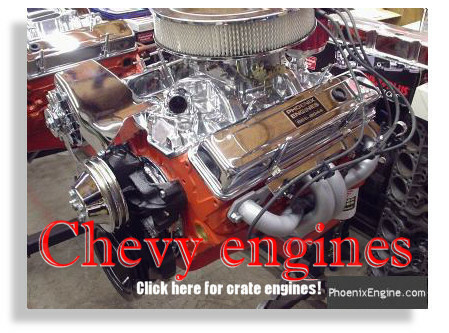 PhoenixEngine.com is also the website for our subsidiaries, including PhoenixMuscleCar.com and ArizonaMuscleCar.com. YES, WE HAVE MUSCLE CAR TURNKEY CRATE ENGINES! (Click on the CHEVY photo above to go to the Chevy section of our Catalog. Click on the FORD photo to go to the Ford section of the Catalog.) We have Chevy and Ford High Performance engines. This is Phoenix Engine (www.PhoenixEngine.com) - the home of the Power 1, 2, 3, 4, 5, and 6 Engine® series, and for well over 45 years we've specialized in handcrafted quality rebuilt automotive engines and custom engines for muscle cars, street, hot rods, kit cars, trucks, 4x4s, vans and jeeps. BOOKMARK THIS PAGE! Put us in your Favorites to make returning here easier! We are pleased to offer our line of Power Engines as TurnKey or Complete Crate Engines. 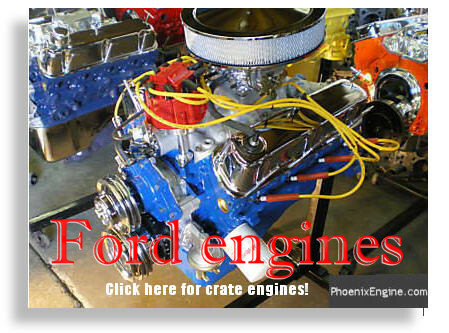 Click HERE to go to the Crate Engine Catalog. Be sure to check out our Vortec upgrades available too! These are some of the engines you can purchase by calling us -- put our expertise to work for you and get the exact engine you need for your application! Engines for three and five window hot rods / rat rods, etc. WE USE ONLY QUALITY PRODUCTS TO BUILD YOUR ENGINE: HOLLY SNIPER FUEL INJECTION, EDELBROCK CARBURETORS, HOLLY CARBUERTORS, MSD IGNITION, PERTRONIX, FITECH FUEL INJECTION SYSTEMS, AND MORE. We can custom build any engine: 300HP to 700+HP. We do not do "production builds" -- all our engines are carefully handcrafted. We have first and second generation Chevy Vortec engines, too, as well as Dart Iron heads! Ask about our PAY AS YOU GO program. In this tough economy, we do our best to help you get the engine you want. At Phoenix Engine, we make sure the job is done right the first time and will not rush our work. Our engines are carefully handcrafted using the highest standards, tolerances and machine equipment. We categorically use the highest quality parts, materials, testing procedures, and assembly techniques for every engine. Muscle car owners have depended upon Phoenix Engine for over 45 years to provide quality work and dependable Power Engines®. We've developed and engineered our engines to be test proven in street machines, race tracks and by the weekend warrior. See our muscle car pricing page for more information on our Power Engine® lineup. For custom trucks, 4x4s, and vans, the P.E.R. Power Engine® has been proven to give new life and dependability to trusted vehicles whether on the highway or off road. Use the navy blue menu at the top of this page to check out our lineup, or click here for more information on rebuilding your engine. Give us a call at 602 866-8044 or email us at [email protected] if you have any questions. We're here to help. Disclaimer: Please note that any information on this website, including pricing, is deemed accurate but is not guaranteed. Any pricing information is presented as a guideline only; you must call or email us for a customized estimate. Thank you. is proud to be American.